BladderCare® is a proprietary blend of special pumpkin seed extract and 40% soy germ isoflavones. The seeds of the medicinal pumpkin (Cucurbita pepo L.) have been used for centuries as a natural remedy for urination problems. BladderCare® is a water-soluble pumpkin seed special extract that contains the complete spectrum of polar and semi-polar constituents of the seed. Earth’s Creation uses a proprietary HyperPure process that ensures highly selective removal of the fat-soluble components from the extract. Being virtually fat free, BladderCare® allows for increased stability and solubility and absence of rancidity .Soy isoflavones are a class of phytoestrogens, or plant estrogens, which are suggested to help balance hormone levels in the body. BladderCare® is a soy germ isoflavone extract containing a standardized amount of isoflavones, as well as other phytonutrients in soy that are associated with improved health. BladderCare® is also the only patent protected soy germ isoflavone ingredient on the market for use in dietary supplements. Overactive bladder affects millions Every 1 in 6 aging adults is affected by overactive bladder or urinary incontinence effecting their quality of life and confidence. While pumpkin seed has a centuries-old legacy as a natural remedy for urinary problems, BladderCare® is the first clinically proven formulation to target both the symptoms and the causes of incontinence and overactive bladder. BladderCare® is a water-soluble pumpkin seed special extract produced through a proprietary BladderCare HyperPure process that ensures highly selective removal of the fat-soluble components. Being virtually fat free, BladderCare® allows for increased stability and solubility and absence of rancidity. BladderCare® is the only patent protected soy germ isoflavone ingredient on the market for use in dietary supplements. 1 out of every 8 men suffers from bladder leakage in their lifetime. With age men are more likely to experience leakage. 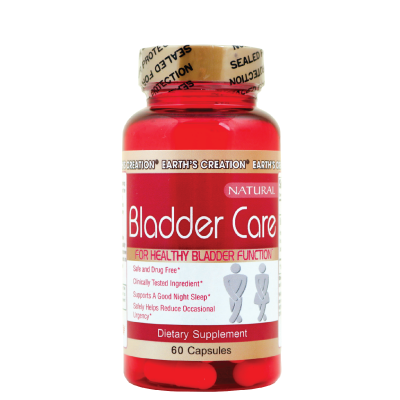 Here at Earth’s Creation we recognize the inconvenience of an overactive bladder, and that is why we formulated BladderCare®. Live your life doing what you love, and do not worry about your overactive bladder anymore. End the embarrassment of always having to know where the nearest restroom is, and stop stressing about leakage. is not considered a normal part of the aging process. The combination of special pumpkin seed extract and soy germ isoflavones has been shown to be effective in the treatment of urinary disorders associated with hormonal imbalances as demonstrated by pre-clinical in vivo research. In summary, clinical studies in men and women have found a reduction in the frequency of urination at night as well as during the day. Incontinence episodes in women were also shown to decrease and subjective improvement in symptoms of overactive bladder were reported. Greater than 60% of subjects reported improvements within two weeks of taking the supplement and more than 80% had improved after 6 weeks. The studies show high compliance and confirm the safety and tolerance of preparations with pumpkin seed extract and soy germ isoflavones. number of incontinence episodes showed the greatest improvement.